Inducted 1993. Won 33 Games and Back-to-Back State Titles. 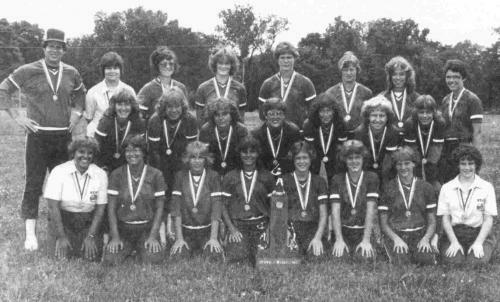 The 1982 softball team had big shoes to fill following the undefeated state championship in 1981. They set their sights on becoming one of the first schools to win back-to-back state titles in IHSA softball history in the one class system. The Lady Raiders successfully accomplished their goal by fashioning a 33-2 record and repeating as champions. The team stormed through regional action and advanced to the Beardstown sectional where it locked horns with perennial state power Bartonville Limestone. The Raiders took the early lead, 1-0, but Limestone answered quickly in the 2nd inning, scored only 1 run after having loaded the bases with nobody out. The game remained tied into the top of the eighth. Limestone lost the lead run at the plate when, with 2 outs, centerfielder Kim Hessing threw a strike to the catcher, nabbing the runner. With 2 outs in the bottom of the eighth and Caren Kemner on second, Hessing lined a single to center, scoring Kemner ahead of the throw. Raiders won 2-1, and were never stopped. QND won the sectional final 10-0 over Hamilton. The Raiders polished off 3 opponents quickly at the state tourney, downing Round Lake 8-1, Joliet St. Francis 7-1 and Elk Grove Village 6-0. Kemner, who had two consecutive grand slams, still a record, Lori Vogel with 3 wins, Amy Eversman with a .909 batting average, also still a record, and Lori Damhorst were all chosen to the all-tourney team. Coach Bill Starkey has said this was the most talented team he has ever seen or coached. The players and coaches were: Head Coach – Bill Starkey; Assistant Coach Sister Jean Dietrich; Stats – Angie Doellman Abderhalden; Ann Kaltenbach Hays and Theresa Preston: Players – Lori Damhorst McCabe, Kelly Druffel, Karen Duesterhaus Schuering, Amy Eversman Robertson, Kim Hessing, Caren Kemner, Karen Wolf Oliver, Karen Kowalski Wiewel, Sue Mast Meyers, Mary McCaughey Kahrs, Anne Rakers Meyer, Pam Schneider Frericks, Caroline Smith, Darlene Venvertloh Butler, Joyce Venvertloh Serangeli, Jill Vogel Wellman, Lori Vogel Inman and Susan Wellman.